It’s Bluebird Time! Get your boxes up NOW! Just when you think you can’t take anymore of this cold, windy, dull, winter – Lo and behold, a beautiful flash of blue shows up in your yard! Your senses perk up, a smile comes over your face and then you start to think…BLUEBIRDS! Bluebirds are Choosing Nesting Sites, NOW! Most people don’t realize that our Eastern Bluebirds start choosing nesting sites now (end of February, beginning of March) — earlier than most other bird species. Although actual egg laying and incubation cycle begins later in the spring, nest boxes should be up and ready!!! Male bluebirds, alone or often already paired off with last season’s mate, will shortly start defining and defending their nesting territory for this year with their gentle song and watchful eye. Want Bluebirds to Choose Your Backyard? If you are one of the lucky, lucky folks who have Bluebirds grace their yard (we are truly envious! ), this is your friendly reminder that it’s time to be a good landlord. Start with a clean box!!! Clean out prior nesting debris in existing boxes, NOW!!! Scrub out the interior with soapy water and rinse well. You’ll also need to clean the box a day or two after each brood leaves. Bluebirds normally have 2-3 broods each season. Rule of thumb: Unless there’s an active brood in your box, it should be empty and clean. This makes Mama happy and increases the lifespan of your box. Position boxes in open areas at least a hundred yards apart. If placing new boxes, be sure they face the openness of a yard, meadow or field. Use Sparrow-resistant boxes. Keep House Sparrows out of nest boxes!! This is critical to a Bluebird’s nesting success!! We recommend Slot Boxes or the Gilbertson Nest Box for this purpose. 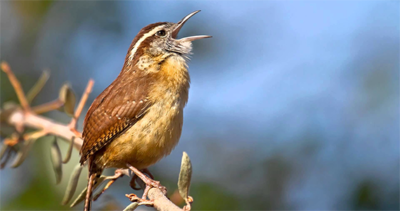 Otherwise, please be diligent landlords and regularly monitor for pesky Sparrows. They are competitors and predators of Bluebirds, so we can’t emphasize this point enough!!!! Mount bird houses on poles with snake baffles. Even if you don’t see snakes in your yard, they are more common than you think and love plump little nestlings for dinner. This will definitely optimize the number of healthy fledglings you facilitate. Don’t underestimate this detail. 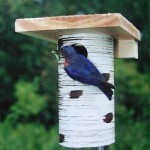 Offer our freeze-dried meal worms in a separate feeder, away from all your other feeders.Although Bluebirds aren’t considered traditional backyard feeding birds, this can be an added incentive for them to choose your yard during nesting season!!! The staff at The Backyard Naturalist are always happy to answer any questions to help enhance your Bluebird experience. Keep us posted! For more reading and resources about the Eastern Bluebird resurgence, continue to It’s Bluebird Time Part Two.